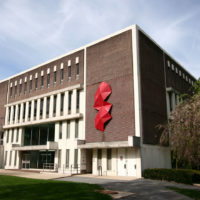 Home of the Lakin Holocaust Library & Resource Center as well as Archives and Special Collections, Albright College’s Gingrich Library is an integral part of the academic experience. The original three floors of this building were constructed in 1964 and the fourth floor added in 1977. When the building opened students formed a human chain from Alumni Hall, where the library had previously been located, to the new structure. Books were passed along from student to student into the new library. The library, strategically located at the center of campus, is on the second, third and fourth floors. It houses more than 352,000 print and electronic books, periodicals, records, audiovisual materials and a wealth of digital resources. College administration occupies the first floor of the building. The Academic Learning Center is located on the lower level.